Do we need NAFTA more than NAFTA needs us? OTTAWA, Oct. 3, 2017 – As Canadian negotiators prepare for a fourth round of NAFTA talks, set to begin in Washington next week, observers are wondering how talks can progress in the face of serious policy disagreements. One business pundit is urging the Canadian government to “get serious” about access to the largest market in the world and work with Americans to create a stronger dispute mechanism. The U.S. would like the dispute resolution mechanism under Chapter 19 of the NAFTA amended. But there is currently a large gap between the U.S. and its partners. 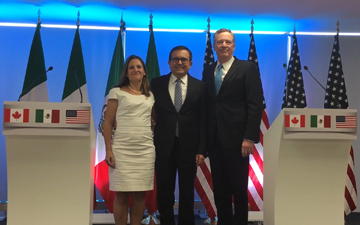 Canada and Mexico support the existing dispute resolution process, which has, for example, ruled in favour of Canada with respect to softwood lumber disputes with the U.S. in the past, notes Brian DePratto, a senior economist with TD Economics in Toronto. “I think Canada and Mexico are both going to be keen to see them preserved. That can definitely be a big wedge issue,” he says. Another area that has upset the U.S. is the trade balance. President Trump campaigned by repeatedly stating that the U.S. was getting the short end of the stick under NAFTA, particularly with Mexico. Lee says NAFTA has been good for all sides but very good for Canada. “For the past 20 to 30 years, Canada has had a very good NAFTA agreement, where we’ve been able to go into the U.S. and sell many products to many industries. “I certainly hope that we don’t etch in NAFTA what Donald Trump wants, which is for the Americans to have access to federal government procurement, provincial government procurement, and municipal government procurements in Canada,” says Cyndee Todgham Cherniak, founder of LexSage Professional Corporation, an international trade law and sales tax firm in Toronto. “However, they don’t want Canadians to be able to bid on U.S. contracts. It has to be U.S. steel, U.S. aluminum, and it has to be U.S. labour. They’re basically saying ‘open your market, but we’ll close ours.’ That’s just a no go,” counters Todgham Cherniak. “Trade is a two-way street. There’s give-and-take. Focusing in on trade deficits and trade surpluses is missing the mark,” she emphasizes. Colin Ellis is editor-in-chief of Canadian Accountant. With files from Jeff Buckstein, CPA, CGA. Should accountants feel threatened by NAFTA negotiations? The TN non-immigrant visa has expedited cross-border work for CPAs on both sides of the border. Could Donald Trump hold it hostage?